Right in the heart of Harbor Country, Harbert Del Lago is located on Lake Michigan in the peaceful community of Harbert, MI. Enjoy amazing views of Lake Michigan from inside and out, or simply relax and enjoy the private beach below. This dog-friendly home is at the end of a private road with no through traffic, making it the perfect quiet lakefront getaway for your family! A great patio deck with a brand new hot tub overlooking Lake Michigan sets the tone for this beautiful lakefront property. The front and back yards consist of beautiful terraced lush gardens that are professionally maintained. A flight of railroad tie stairs leads up to the house from the front parking area. The front door enters into the main floor living area, which includes a TV room overlooking the front drive to the east and a large, comfy living room with stunning lake views to the west. 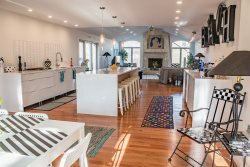 The recently remodeled kitchen and a dining area also offer great lake views and are located at the northwestern end of the house. The three bedrooms are all on this main level. The first is at the northeast end of the house and features a king sized bed. The second bedroom is considered the master bedroom, and it has a queen bed and a newly remodeled bathroom en suite, along with great views of the lake. The third bedroom has two twin beds and looks out into the woods to the east of the house. There is also a sleeping loft located over the kitchen that overlooks the main living and dining areas. It is accessible by a sturdy permanent ladder and contains a twin mattress. We consider this as an extra sleeping for the youngsters in your group. The lower level of the house has a game room with a ping pong table, which leads out to the screen porch via sliding doors. The game room area also houses the laundry area and two bathrooms, both of which have also been remodeled recently. An outside door from the kitchen leads to the upper patio deck with a recently purchased gas grill, a table and chair set for casual outside dining, and a four person hot tub. This deck is elevated above Lake Michigan and affords amazing views, even while soaking in the hot tub! The beach stairs lead down from this deck to the screened porch at ground level, and then in turn down to your private beach below. There are 101 stairs down to the beach, with a nice resting bench about halfway down. Non-aggressive and non-shedding dogs only please. Jon Darby is extremely easy to work with. He has been my Yellow Bird contact for the past three years. Great customer service. Beach access & the large lovely deck to enjoy the View of Lake Michigan and the gorgeous sunsets. Jon was the person who helped us find and book this property and also helped us when we went to the wrong office to get checked in! He has always been extremely helpful and we enjoy working with him! Loved everything about it!!! The location, the house, kitchen well stocked, the beach, the deck and hot tub, close to many local communities. We annually have an entire family vacation and SW Michigan is the most logical meeting place for our extended family to meet up. We have worked with just about all the vacation rental property management agencies in the area over the years and Yellow Bird is one of them.